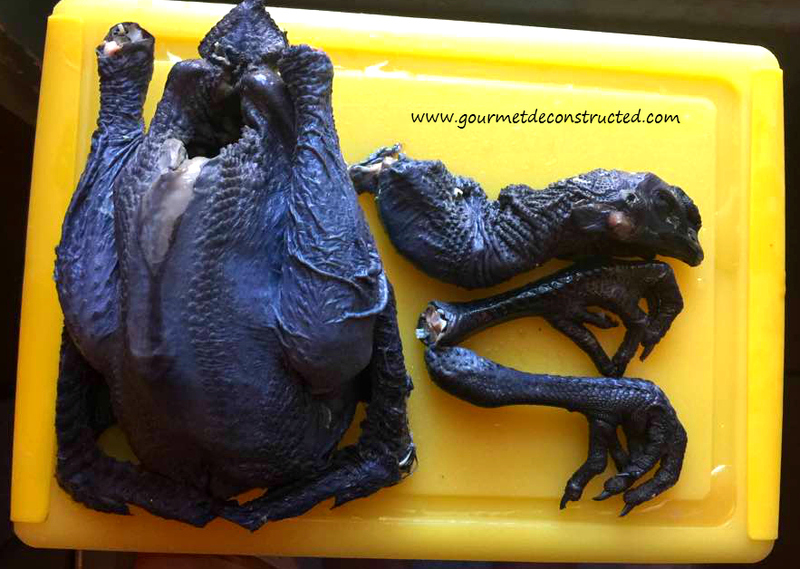 A black-skinned chicken? Say it ain’t so. This was my first reaction while shopping at a new Asian market in my neighborhood. I have heard that chickens like this existed, but I have never actually come across one myself. There was no way I was going to leave the store with out one! Although there is something about this chicken that makes me uneasy, I was very curious to find out more about it. I learned that the Silky is a breed of chicken named for its fluffy plumage, which is said to feel like silk, and satin. They are a really cute breed of chicken because of this. It is also unknown exactly where or when these birds first appeared, but the most well documented point of origin is ancient China. 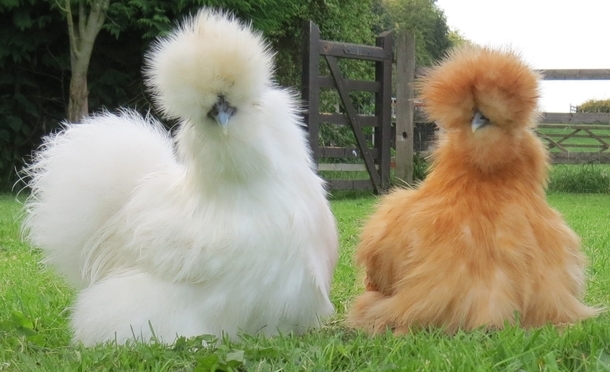 Once Silkies became more common in the West, many myths were perpetuated about them. Early Dutch breeders told buyers they were the offspring of chickens and rabbits, while sideshows promoted them as having real mammal fur. But today there are many American farms that breed them, and I guess that’s how it landed on my plate. So upon returning home and unwrapping the chicken, I saw that the entire chicken was a blueish-black color from head to toe. The meat was grayish-black, and I would be lying to you if I say I didn’t freak out a bit. I mean, it’s not everyday I eat meat that has that color. But being the adventurous cook and foodie that I am, I will not be scared of a bird! Season the chicken with salt and pepper, then heat up 2 tablespoons of the oil over medium-high heat. Add the chicken pieces to the pan an sear on all side until they are lightly browned. Remove from the heat and set aside. In the same skillet add the rest of the oil and heat over a medium high flame. Add the onion and a sprinkle of salt and cook, stirring , until the onion has softened about 5 minutes. Add the ginger and garlic and cook until fragrant, about 30 seconds( try not to burn the garlic), while stirring continuously. Add the bell peppers and carrots. Cook until the bell peppers are fork-tender, 3 to 5 more minutes, stirring occasionally. Then add the red curry paste and cook, stirring often, for 3-4 minutes. Add the coconut milk, stock, chili paste (if using) and sugar, and stir to combine then add lemongrass stalk and seared chicken pieces. Bring the mixture to a simmer over medium heat, for about 10-12 minutes then add the green beans . Reduce heat as necessary to maintain a gentle simmer and cook until the peppers, carrots and beans have softened to your liking, about 8 to 10 minutes, stirring occasionally. Remove the pot from the heat and season with soy sauce and rice vinegar. Remove the lemongrass stalk and add salt, to taste. Divide curry and chicken into bowls and garnish with chopped cilantro. Can be served with Jasmine rice. Bon Appetit! 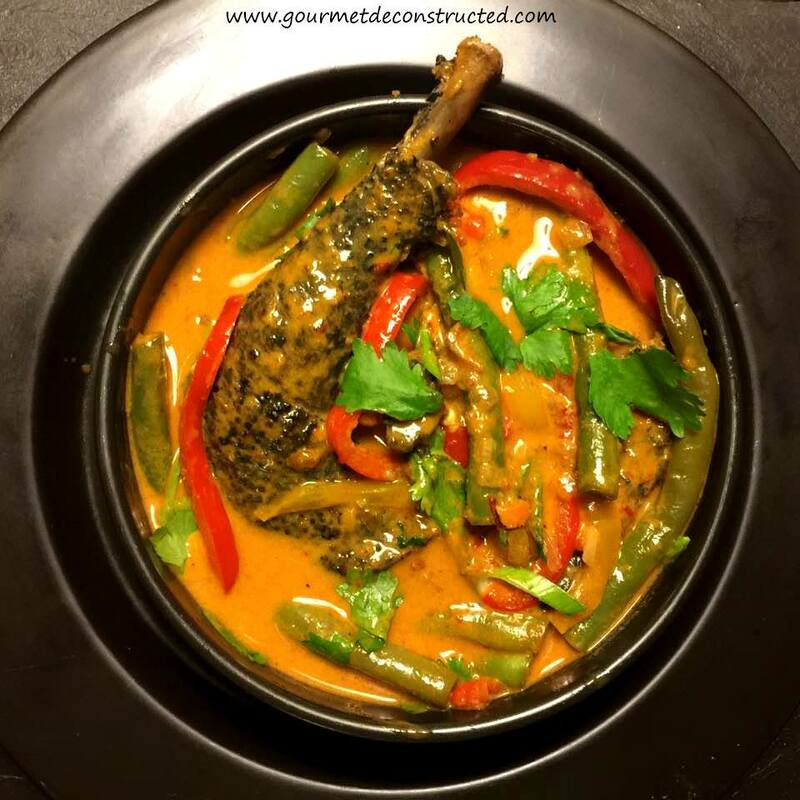 Posted on October 26, 2016, in Poultry, Wild Game and tagged bell peppers, coconut curry, curry, curry paste, curry recipe, fluffy chicken, green beans, lemongrass, red curry, silky chicken, Thai food, wild game. Bookmark the permalink. 2 Comments. As the saying goes – You learn something new every day. Thanks Justice. Kind of like a baby EMU!